The topicality of researches devoted to interaction of surfaces in the process of friction on the small size of the actual contact area is substantiated. That interaction occurs into tribomates of many machines, and mechanisms as well as in the process of technological running-in. In relation to the plain bearings by the method of slip lines is shown, that at plastic deformation of micro-roughness is convergence and overlap of the deformed parts under them. The modeling of real interaction by the introduction of the hard cone with a certain sizes into plastic half-space, subjected to one of the conditions of plasticity is considered. The basic equations from the results of mathematical modeling of interaction of rubbing surfaces, obtained on the basis of the fundamental assumptions of the theory of plasticity are presented. Evaluation of the results of mathematical modeling on the correspondence of the results of the experiments, established by the method of x-ray structural analysis is given. Keywords: deformation, surface, plasticity, modeling, micro-roughness, material, slip. Zelinskiy V.V. Communication between the parameters tribocontact during running // New materials and technologies in mechanical engineering research institute. Volume 1. – Bryansk, 2002. – P. 41-44. Zelinskiy V.V. Phenomenological bases of the isofriction running-in of supports of the slip of machines. 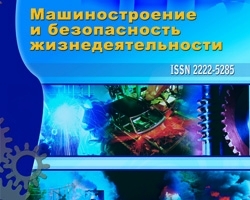 Part 1 // Engineering industry and life safety, 2009, № 6. – P. 117-121. Zelinskiy V.V. Phenomenological bases of the isofriction running-in of supports of the slip of machines. Part 2 // Engineering industry and life safety, 2011, № 3. – P. 48-52. №4 (14) 2012, Plastic equilibrium of the surface layer of the friction, Zelinskiy V.V.